You have not carved out your target audience and you realize that the odds are against you and you go for quantity. You want to get the attention of every attendee in the show hall. As a result, you put little effort into each face to face interaction as possible, thus giving you the resources to have as many interactions as you can. Invest far more in each interaction than any rational human would advise. Use your trade show presence to know your target audience. Invest thought and time in creating your offer. "Don't personalize, be personal." Yes, people can tell the difference between doing and caring. "And they're significantly more likely to give you an interview, make a donation, answer your question or do that other thing you're hoping for if you've signalled that you're actually a caring, focused, generous human." CARING IS THE STRIKING ADDITIVE, THAT ELEVATES YOUR ORDINARY OFFERING INTO EXTRAORDINARY. 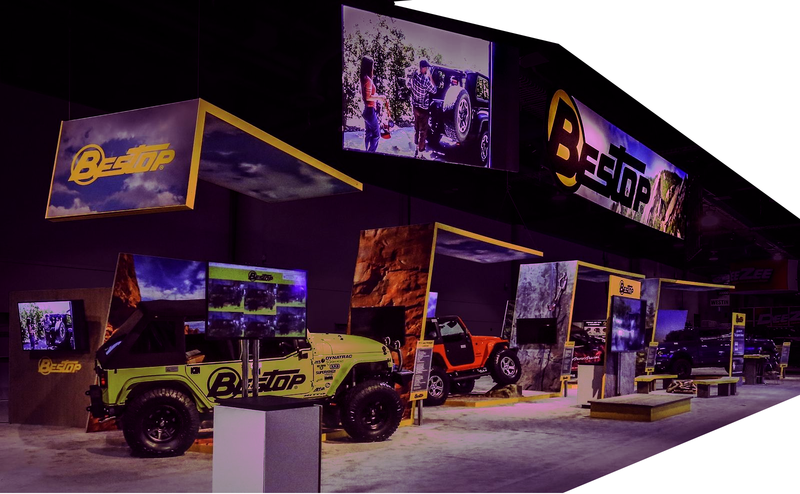 Being able to direct the future of your trade show marketing is imperative to the success of your brand and your company. 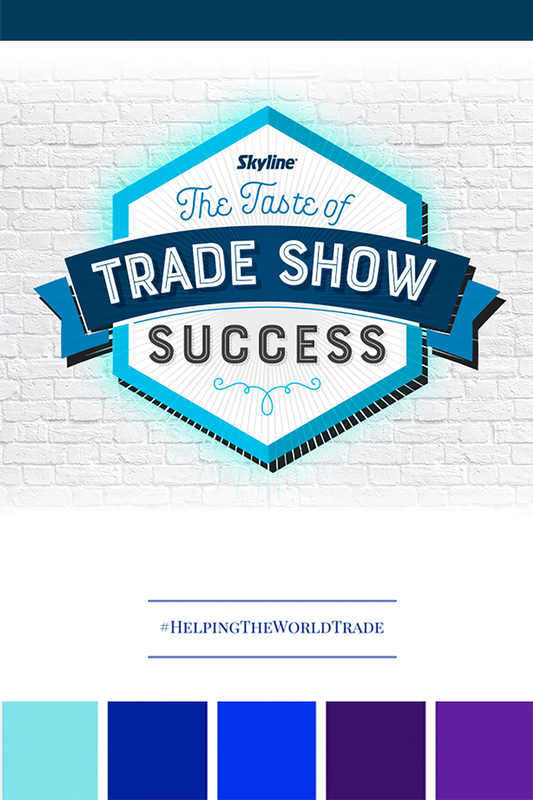 For many of our clients, trade shows are the only events that they go to. Yet, they actively fail to participate. As you know, there is a key difference in doing something just because you are mandated to do so and active proactive participation. If done with care, live events and trade shows energizes your brand and activates your brand offering in a dynamic way. The noted futurist and the best selling author, Daniel Burrus states being able to stay agile, or staying proactive is less than desirable in an increasingly competitive international business landscape. It takes something more. "The ability to take a sudden burst of insight about the future and use it to produce a new and radically different way of doing things – solving problems, crafting must-have products, creating high-demand services or building new businesses." Today, Daniel Burrus is our guide in providing us with some insights on ways to 'flash forward' your trade show marketing. Taking the lead from Daniel Burrus, WE WILL carve out a path that will help you drive leads TO HELP YOU LEVERAGE YOUR MARKETING, create memorable moments and more importantly, help you stay ahead of the curve. As event marketers, you know that trade shows are the undisputed frontiers of face time marketing. Along long with electronic media, trade shows have retained a greater share of B2B marketing budgets than print and direct mail. That’s because trade shows provide what all marketers want: face time with clusters of decision makers under one roof. BE SOCIAL — Take full advantage of your face time at shows, because it’s harder to reach buyers elsewhere and otherwise. Acquire knowledge about the way they do business. 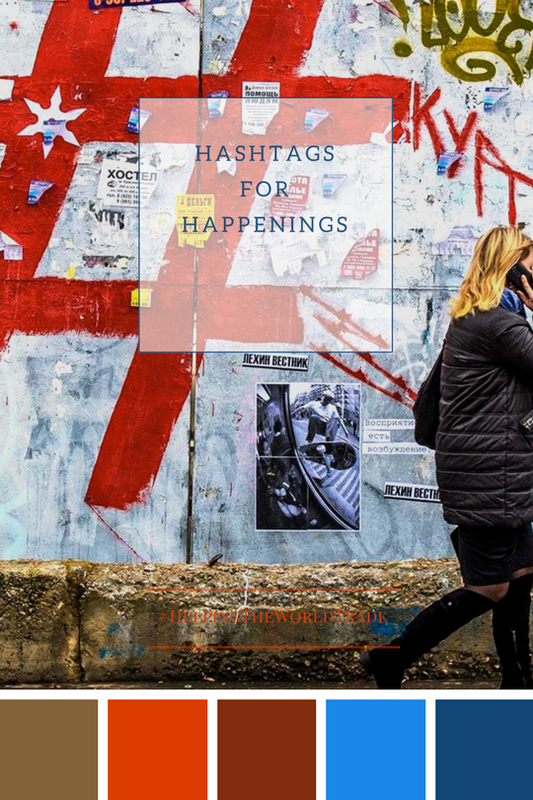 If, your target audience is primarily digital, the first thing thing that you do is have a hashtag in place to promote your event. This means on your website, on the different social channels, blogs, sponsored advertising banners, and all electronic correspondence including your email signature. Every employee, client, prospect, speaker, vendor, and guest should know about it. In other words, go crazy with the use of hashtags. Ask your trade show attendees to use it vigorously and repeatedly. As they are tweeting about your event ask them to tweet it with your chosen hashtag. Find ways to make it profitable for them to to tweet about you. Highlight the live tweet on a good size display that is prominently exhibited in your space. As Guy Kawasaki would say, "You cannot pimp your hashtag too much." "Change from the outside in is typically disruptive. Change from the inside out is purposeful and constructive. This is the kind of change that allows you to direct your future and seize your destiny. And the only possible way to operate in that kind of change is by becoming anticipatory." Good or bad, you know attendees will talk about you, your brand and your products and services. Monitor closely. Anticipate the questions that might be asked about your products or your services. Be armed with prompt answers. Engage the product managers and sales staff if you anticipate any signs of questionable interaction. Do not solely depend on your PR agency. They will have their hands full with the journalists, bloggers, execs and the speakers. ABOVE ALL, REFRAIN FROM SAYING, "LOOK IT UP", WHEN FACED WITH AN OBVIOUS QUESTION — Chances are, that your prospects are more informed than you are about your own product. Attendees look up potential suppliers on the internet before the show, so they arrive already knowing about your products. If they visit your booth, it’s because they want to know if your product really does what you say it can, who your people are and how trustworthy your company is, in other words, they want to experience the culture of your company and the caring vibe that you emit or not. Provide hospitality, have more space for longer meetings, and bring people who can answer detailed questions, but also deepen relationships. Assign a dedicated person to take care of this business of 'social anticipation' and 'social promotion'. Pre show — he or she will schedule promotional posts about the event, about your industry, about your product, about the magic of your business. At show — he or she will live tweet and live stream — what’s happening in your booth space, in the show floor, take pictures and video of speakers and guests and take note of the complaints or grievances about your existing clients, if any. During breaks — he or she will post these pictures and videos to Google+, Twitter, Instagram and Pinterest. She will retweet and reshare other people’s posts about the event. Post show — she will post more pictures and videos and enlist the help of the people who are in these pictures and videos to spread the word. Help them remember your brand with post show experience with the aid of games. 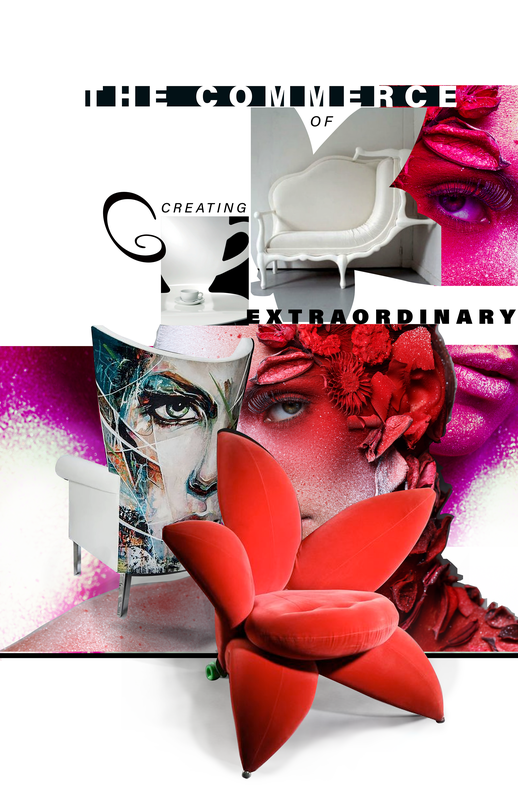 "Transformation means doing something utterly and radically different. It means nanofusion; it means putting oil rigs at the bottom of the ocean and reimagining G.M. on a Dell model." The burning question should be, "How can I give my attendees the ability to do what they can't do but would want to: if they had a choice to?" Here are few ways to do it. Provide fast, free, and unprotected wireless access hub that is dedicated to your booth space only. If you want your event and hashtag to trend, empower your guests to post updates fast and for free. Make it fun for them to tweet about it and reward them with gifts that they have to physically collect from you at your booth space. Engross your audience in the art of gamification. Humans are pleasure seekers and they are hard-wired to perform an act that had given them pleasure before. App-based games increases active participation amongst your attendees and enhance their show-going experience. Gamification is not a one size fit all. And, there is no reason why you cannot design your games based on the cross section of your target audience. Indulge in this in-depth article. Growth and Customers, Profit and Sustainability and Trust. Tap into Trust when you do Virtual Reality Right — Save yourself the cost and the effort of exhibiting, if your booth design has a wall with a VR setup that includes a table, a chair and a head seat. “Where’s the sense of falling into the story?" Instead of just focusing on the technology for the sake of technology, use real-world elements in your VR setups to enhance the total experience. At the Propelify 2017 Innovation Festival, David Polinchock, who has worked in the virtual reality (VR) and experiential advertising space since the 1990s, explained, the three big ways technologists, marketers and companies need to improve their use of VR and AR to create amazing experiences in the future. A company selling outdoor gears wants to create a VR experience that takes place in the woods — add cut out of trees and plants in your space, with branches occasionally brush over their cheeks or arms. Power up Profit and Garner Growth when you Exhibit with a Signature Sensory Experience — Save yourself the cost and the effort of exhibiting if you are not incorporating the science of smell. Smell is the marketing language that is understood at a cellular level. "It allows a company to define itself and not rely on the subjectivity of a salesperson. And it makes it more scalable." The commerce of smell states that people linger in places that smell nice 40% longer and that the intent to purchase can be increased by nearly 80%. 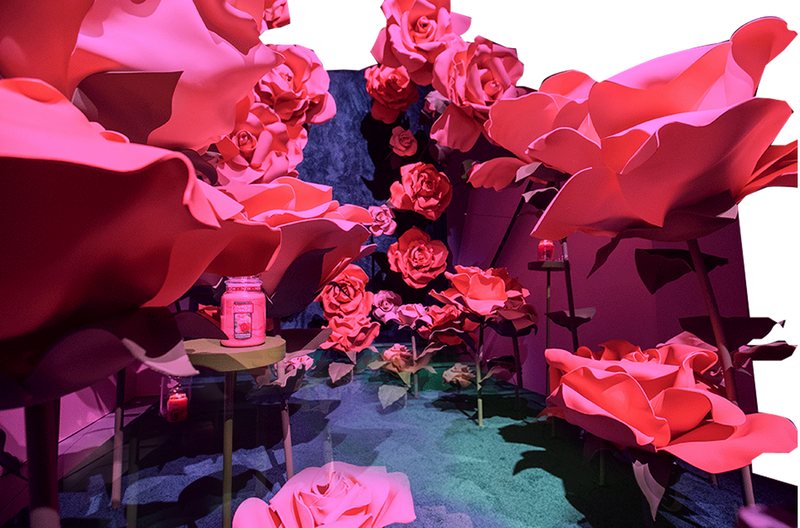 Attach aroma in your next booth design and work positively in creating a superb experience for your attendees. FOOL THE BRAIN BY USING CREATIVE PROPS. IT ENHANCES THE 'FEELING OF SMELL' and provides for easy Instagram moments. Word of Caution: "Smells don't have any meaning prior to being associated with an experience, then after they become experienced with something, that's what they represent," — if your face to face performance on the trade show floor was not good enough, your attendees will remember you for that experience and will conclusively associate the scent with your brand. Use scent with sensibility. "In the twenty-first century, the one and only thing you can depend on is transformation. This means you can’t go backward and you can’t stand still; you can’t rest on your laurels, and you can’t keep doing what you’ve always done, even if you do your best to keep doing it better. The only way to survive, let alone thrive, is to continuously reinvent and redefine. Reinvent and redefine what? Everything." When the electronics giant Philips was radically, loosing it's market share — it recognized that the traditional growth playbook was outdated. The company partnered with Turntoo, to change the game and disrupt an industry they lead. Turntoo offers a digital platform that handles resource management between manufacturer, supplier and end-user. This allowed Phillips to move from selling light bulbs to selling light while enabling energy saving. This move models a path of growth by giving customers what they want, how they want it. Alexa finally did it. Now, computers have migrated from screens into everyday objects. We are learning to interact with them in a way that is conversational and intimate. We are becoming less tolerant of anything that sounds and feel technocratic. This startup, is only few months old, yet, it has received hundreds of requests from companies that are interested in developing their own branded voices. "That’s because Voicery offers something most companies probably didn’t know they needed even just five years ago: a customized digital voice that sounds like an actual human, not a computer." 1. Instead of having one 20' x 20' booth space, go for two 10' x 20'. Spread out in any way you can. Or, keep your 20' x 20' and pay to partner with other exhibitors in their space. 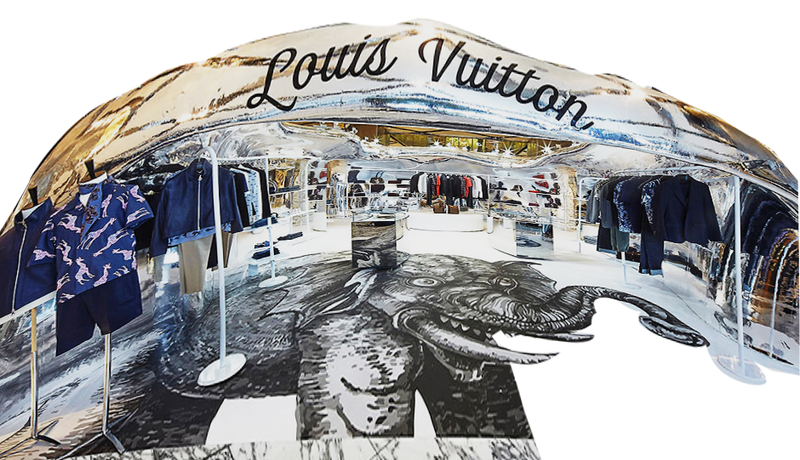 Above, Luxury fashion brand Louis Vuitton redefines retail by creating a printed 3D super structure (approx. 30 ft. by 33 ft), to launch its' menswear collection in a month long campaign at Sydney's Westfield Shopping Center. 2. Hire people, to populate the show floor, dressed in your branded T-shirt and armed with Etch-A-Sketch, with drawings of your logo and or your products — hand out etch-a-sketch postcards to come by the booth. Give Etch-a-Sketches away, every hour. 3. Hand out branded packets of mints or gums with messaging that questions the status quo — every time, they pop in a mint in their mouth, they will think about you. 4. Hire a pedicab company and do a graphic wrap of your brand. 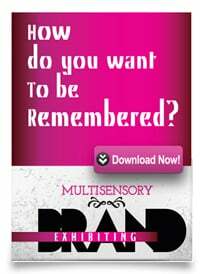 Give the riders your branded T-shirt to advertise you around town. Have them hand out a gift or collateral to riders. Here’s a video of how Levi’s engendered goodwill during Giants appreciation week in San Francisco. 5. Hire flash mob, or impromptu street dancers. 7. Walls for Hire — Put a interactive slide show broadcast on a building outside the convention center. 9. Get a street musician sing your brand messaging and the local hot dog vendor, or any food vendor, give out food for free - with your branded paper holder. "Our social networks have turned us into unpaid factory workers, toiling in a giant system, one that pushes us to feel shame, to be in a hurry, to worry about nothing but the surface." — In other words, we are denying ourselves the sauce of creativity, thus aiming to keep our standards, mediocre at best. Take your time. Yes, it is a rushed economy of instant gratification — however, keep in mind "you are, what you share." Go beyond the surface, digitize your social events with care and creativity. 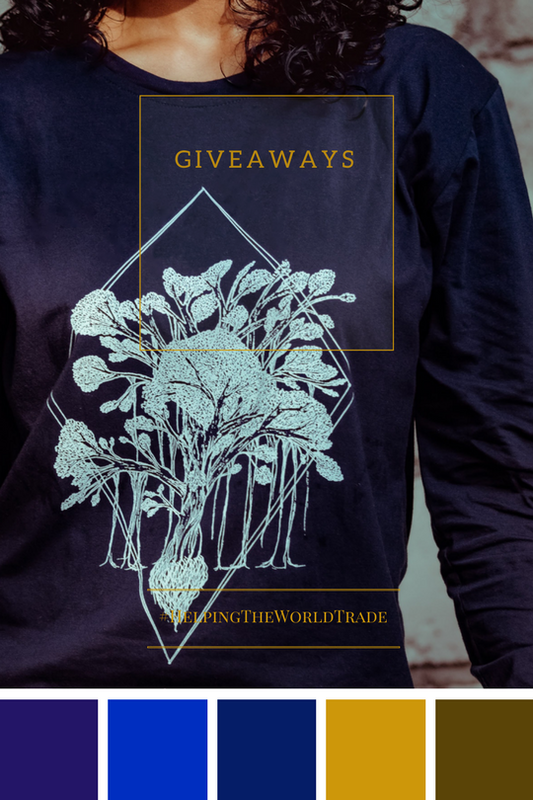 Find ways to enrich your trade and inspire your industry. Uploading pictures are a great way to promote your trade shows, but very soon you suffer from 'sameness', because it is more of the same. Guy Kawasaki mentions a creative way of doing it instead. Shooting a slow-motion video is a perfect way to capture and share the images of dozens of guests. Just turn on your camera and walk through the crowd, use a 360° camera, as shown below. Here are some power tips that Guy provides: First, walk fast. When viewed, slow-motion video is approximately six times longer than regular video. Second, YouTube lets you add music to the video, and music makes a slow-motion videos sing. Third, grab the long link address for the video in your browser address bar (not the address you get by clicking on Share) and add “&hd=1” to it. This will ensure that people see the high-definition version. Above, a 4.2 seconds video that has been slowed down, to give you the impression of extended time. Before the age of the 'digital', the competitiveness of your brand depended on your ability to protect the core of the company. But, "digital tears down those fortresses, eroding barriers and blurring industry lines." In a matter of few months, small no name brands, can take a piece out of their gargantuan rivals. Hence, the need to Redefine Competitiveness. Doing so, will aid you to take an approach that crisscrosses the road between growth, profit, sustainability and trust. "Those who manage, will be able to thwart even the greatest rivals." Here, we have only used 4 of the 7 principles that Daniel Burrus prescribes in his New York Times bestseller book, Flash Foresight. Read the book. You will discover hidden opportunities, gain perceptive advantage in your marketing strategy and using the power of certitude you will transform your brand and your business. acknowledge, that, live events provide attendees with a valuable opportunity to form in-person connections in an increasingly digital world. plan on investing more in live events in the future both in budget and number of events. 80% of businesses that are over performing in regards to their company goals will increase their live event budgets in 2018. 50% of marketers say that their organization is “very committed” to planning live events. IN THE AGE OF 3D PRINTING, IT IS A SHAME IF YOU FAIL TO TAKE ADVANTAGE OF THE TECHNOLOGY AND CONSTRUCT CREATIVE PROPS AND DESIGN ENHANCERS TO MAKE MEMORABLE EXPERIENCES. Design hashtags that will help you qualify your leads. Usually action oriented hashtags or problem defining hashtags work quite well to garner traction. Your overworked sales force, will appreciate it and the interested prospect will be happy to talk to because their challenges are being defined for them. Scent acts as some sort of cerebral glue, associatively tying together all thoughts and experiences pertaining to a brand. Smart marketers can take this principle one step further by aligning multiple marketing channels with one consistent smell. Engaging attendees outside conventions centers can be challenging. Nonetheless, creative forms of mobile billboards, bicycle billboards, and hotel marketing and can be very effective.